But most of us know that entrepreneurs are workaholics, so I’d also suggest that your wellbeing as an entrepreneur is not going to look after itself. Nor would I suggest any further nannying by Governments into the lives of those who choose a life where work is play rather than a chore. How then do entrepreneurs look after themselves such that they achieve a happy balance between work, learning and play? 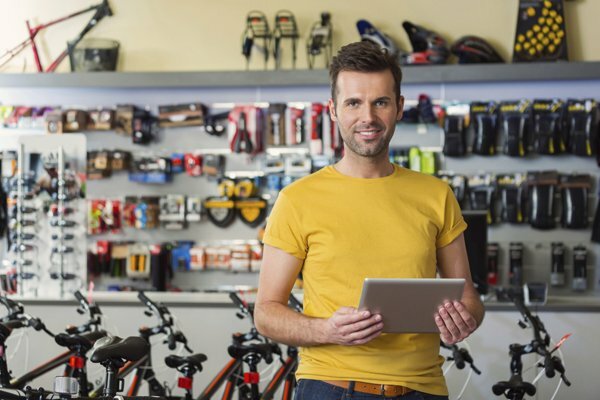 Here are some lessons I’ve learnt over 20 years of running an entrepreneurial business. Wellbeing is all about good time management – yes, you can work flat out for “eight days a week”, but one of the trade-offs for being your own boss is to work when there is demand and take time out when there isn’t. The trick is to actually do this rather than working through. After 20 years of working for (and against) myself in this respect, my top tips on time management are as follows. 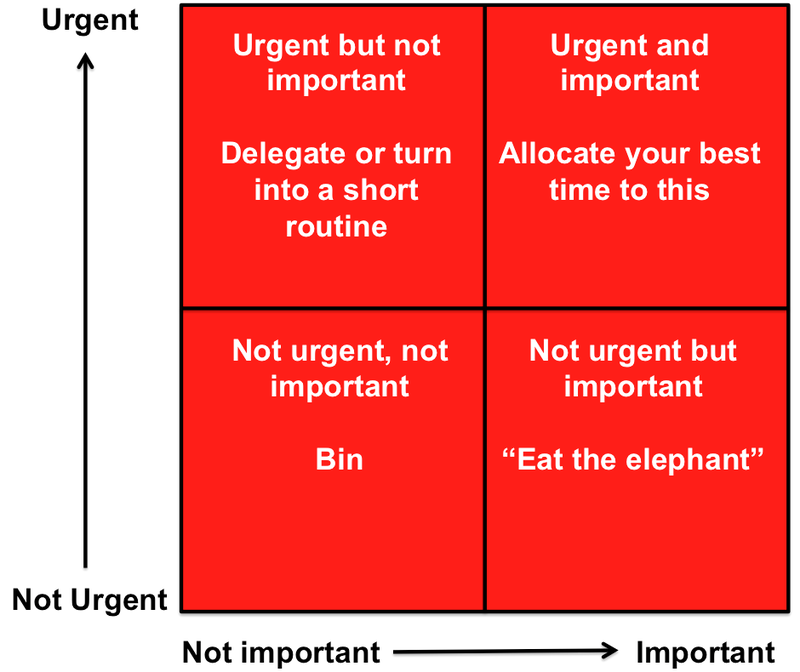 One of the most important things I ever learnt was the so-called urgent and important grid. This helps you allocate time to the most important things that matter to you over the long term. It also identifies those items that require sustained effort (eating elephants) over the long term and those tasks that you need to learn to delegate or turn into a short routine. Leadership is as much about what you say no to, as well as yes. Staying focused but also remaining open to opportunities is not just a clever play on words. Manic focus prevents you from developing your business but it may block off new ideas. Be firm but kind when saying no to others to maintain relationships. Playing with the kids is important but it’s not urgent in time management terms. Take this strategy to extremes and your family may forget who you are! Protect family time above all else. The strategy of ‘eating elephants’ is a good one to learn, whereby you nibble away at your biggest tasks systematically. I’m presently writing a new book using the ‘elephant eating’ principle, writing at night when I can get several hours of uninterrupted time accompanied by music and a glass of wine. 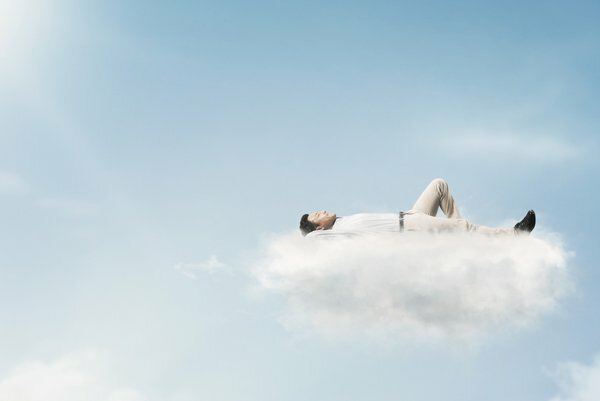 Eminent neuroscientist Dr Daniel Levitin suggests that to be more creative & effective we should allow 10 to15 minutes to daydream every few hours. Levitin also suggests that a 15 minute nap is an effective strategy for wellness. Any longer than this tricks your body into thinking it is about to go to sleep, which has less positive effects on wellbeing. It’s important to find a mode of exercise that you actually enjoy rather than trying to impose a fitness regime on yourself that you hate. I personally prefer a swimming and cycling, but it’s really about finding your sweet spot. A brisk 15 minute walk makes your final two hours of work much more productive. All work and no play really does make us dull. In my case I love to play music and have somewhat cheekily integrated this into my work, as part of the ultimate time management strategy where work = play. If you don't have the option of turning your hobby into work, make sure you make time for some play. As well as all the above, to maintain wellness in your business, devote time towards continuous learning in an age where the "half life" of knowledge is in freefall. Learning can take many forms and work itself is often more valuable than a training course. Wellness really does boil down to a happy balance between Work, Learning and Play. Get the balance right and prosper.